It would be easy for me to say this is déjà vu from Game 3 and insert the final score with the Spurs on the winning end, but I am better than that. Kawhi Leonard is better than everyone in the 2014 NBA Finals. Leonard led the way for the second straight game, and now his Spurs are just one win away from an NBA championship after a 107-86 win over the Miami Heat in Game 4. His stat sheet read 20 points, 14 rebounds, 3 assists, 3 blocks, 3 steals and suffocated whichever Heat player he guarded with tenacious defense. Give Leonard the series MVP trophy, history states: the series is over. “They smashed us,” LeBron James said. “Two straight home games got off to awful starts. They came in and were much better than us in these last two games. It’s just that simple.” No NBA team has overcome a 3-1 deficit in the Finals, and the way the Heat were smashed twice on their home floor makes it hard to imagine the two-time champions being the first. James had a solid game, but he received practically zero help from his team. James had 28 points and eight rebounds, but Dwyane Wade was just 1-of-10 through three quarters and finished with 10 points. The Heat are allowing 107.2 points per 100 possessions this postseason, by far their worst mark in any postseason in the James-Wade-Bosh era. The Spurs have won 11 games by 15 or more points during the 2014 playoffs, the most by any NBA team in a single postseason. Entering the game, the Heat hadn’t lost back-to-back games in the playoffs since dropping three straight against the Boston Celtics in the 2012 Eastern Conference Finals. 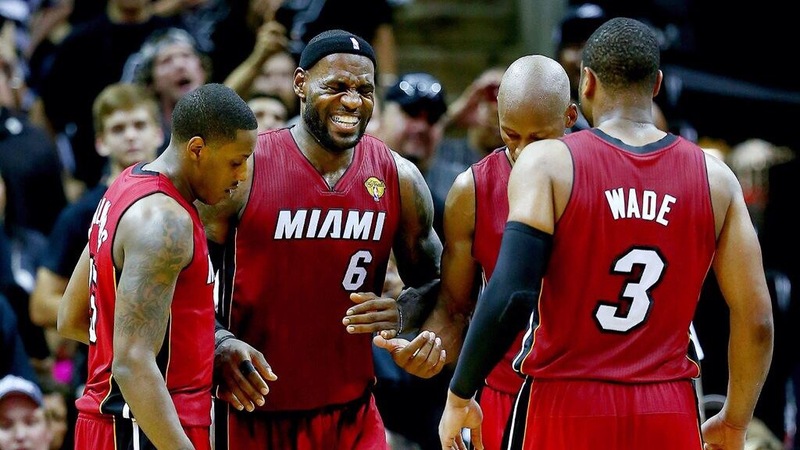 The Heat are on life support and the Spurs are looking to pull the plug. They can win their fifth NBA championship with a victory at home in Game 5 on Sunday and avenge their seven-game series loss to Miami last year.